If you want great sturdy ocean going sailboat with your pocket book in mind, and you know you want a capable boat that can sail far if you desire, well… there is only a handful of high caliber, robustly built, proven sailingyachts out there to choose from. Our blue water boat favorites are always the ones that beautiful, safe, comfortable and capable and those that will hold their value.This Shannon is one of them. The Shannon 43! One of our all time favorite builders has and will always be Shannon Yachts, an icon of New England Boatbuilding for some forty years. Shannon Yachts are beautiful, no compromise, world voyagers; if you look at the 38, 43, now 47 and theirold flagship, the 50/51 it is easy to see why we all agree they are lovely. Of all the Shannon Yachts, it is the 43 that seems most perfect for a couple or a small family. Indeed they are all as beautiful on the outside as they are on the inside. The Shannon 43 has just about the world’s best cockpit wherein the helmsman has perfect seat with great visibility port and starboard. The Shannon 43 design combines excellent offshore sailing characteristics with good speed in even light air on all points of sail, and provides exceptional seaworthiness.The interior provides sumptuous space with a two stateroom layout for comfortableaccommodations for living aboard full time. The classic cutter rig with in mast furling and roller furling head sails provides the capability to shorten sail or set sail for each wind and sea condition you may find yourself in. With the cutter rig, the smaller headsails easily managed by a solo sailor or a couple. And with the in-mast furling mainsail, it is easy sailing from the safety of the cockpit. The Shannon 43 is the perfect sailboat for a couple to sail together and live aboard anywhere in the world, while maintaining a comfortable lifestyle. The 43 is manageable underway by one person, but can provide accommodations for crew of family. She is big enough to carryeverything you need with amazing capacity for fuel and water and storage for ships stores to venture far. The design intent of the Shannon 43 hull was to create a boat that would perform well in the wide range of wind and sea conditions experienced by the offshore cruising sailor. With some 45 of them sailing around out there, we can say that the design works really well. Our special offering, the Shannon 43 Anna Crewe is a lucky boat with magnificent owners who have maintained her well and used her lightly. They replaced the diesel in 2017 just for you and they have invested in making Anna Crewe a lovely comfy cruiser in Puget Sound. 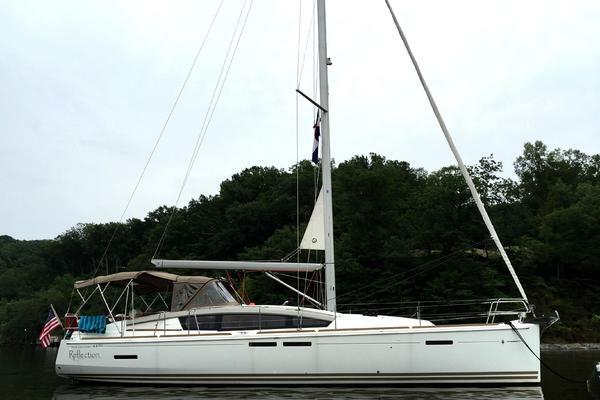 Now she is ready for a new owner to take the helm! New cozy cabin heater…the fireplace! 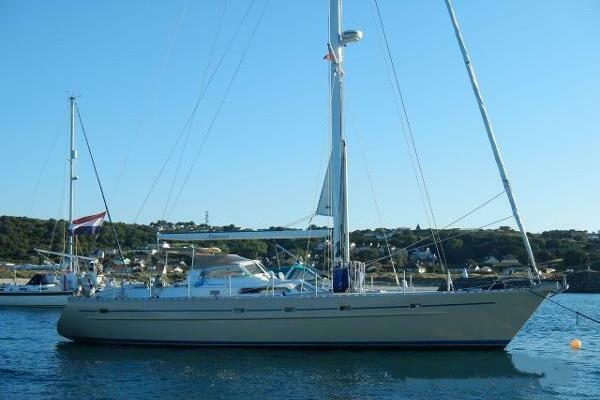 Call now to chat about this lovely Shannon 43 waiting for you in the Pacific Northwest! She is a lovely vessel. Call now. This high quality, classic blue water boat offers wonderful ambiance with all the substance that makes beautiful things worth owning. You and your guests will not tire of the splendid interior, beautiful woodwork, and warm lighting. Isabella is inviting, warm, and charming with all the space you need for your family or friends to join you on that cruise. As you enter the main salon, the spacious galley is to starboard with the main salon just forward. The L-shaped settee to starboard has a beautiful drop leaf table that opens to seat six and even eight. The cushions add to the elegance of this timeless vessel. The L-shaped settee to port gives you ample seating and makes into a double berth as well. Actually, you can sleep eight fairly comfortably, and two couples can enjoy the ultimate accommodations in the forward and aft staterooms. The owner’s forward stateroom is very, very comfortable with a massive V-berth which has been lowered to accommodate a luxurious comfy mattress. There is ample storage for all you need with shelves, drawers and lockers. The cabin lights, both overhead and reading lamps are a great addition. With the bathroom just aft of the master stateroom, you have privacy and space. The Corian counters, Alpenglow lighting, custom Delta faucet, electric toilet, and separate shower stall with a teak grate. The guest stateroom aft to port offers a double berth with a custom mattress with plenty of storage, beautiful lighting, space to move and dress, and access to the aft head with Corian sink and standard marine toilet, separate shower with teak grate and beautiful lighting. The vessel is as comfortable as you can imagine. Three sets of companionway boards - one solid, one with windows to let light in, and one with screens! New Propane Dickerson Newport Fireplace! This vessel is perfect for a liveaboard or cruising family or a couple with friends that want to visit. The beautiful galley is the classic U-shape with loads of counter space, drawers, and storage that rival your kitchen at home. You will not suffer. Aft head has a beautiful vanity, sink and also a separate stall shower with seat! Garmin (mew) 840 Chart Plotter with charts for Canada and Alaska and US! New engine with all new everything! Dual Racor fuel filters with pressure gauge reading at the nav station! Engine mounts all new with NEW YANMAR! Great electrical system with Westerbeke Genset 7.5 KW and ample battery bank of 750 amp hours! The boat was rigged with solar panels at one time and with air-conditioning, however in the Pacific Northwest, it is not needed as was removed, but perhaps easy to replace if you want to go elsewhere! Alaska is great! Electric bilge pumps: Rule 2500 with float switch, Jabsco diaphragm pump under aft bunk! This pilothouse sailboat is rigged as a cutter with a club footed self tacking staysail equipped with roller furling. The twin head stay is set up with a full roller furling Genoa and a working jib. You can go downwind with double headsails and end up in the South Pacific if you like. The in-mast furling mainsail is infinitely reefable from the cockpit which is pretty good. The design intent of the Shannon 43 hull was to create a boat that would perform well in the wide range of wind and sea conditions experienced by the offshore cruising sailor. She does that! You'll be safe and comfortable with this type of cruising rig and sail plan. Primary sheet winches: Lewmar Electric! Classic gorgeous traditional, real boat shape! Keel centerboard design with great windward performance and shoal draft if you need it! Beautiful high bow, cutaway forefoot. Looks so beautiful you know it sails well! Beautiful T shaped cockpit with the best helm station aft ever! Full dodger with hand hold 2014! New Navpod with Garmin 84C display for chart plotter, wind instruments! Manual emergency bilge pump in the cockpit! Engine instrument panel for NEW YANMAR! Nine foot rowing dinghy that rows and tows nicely!